The Fujifilm FinePix X-S1 belongs to the Fuji X family of premium cameras, which are characterized by high-end specifications, high-quality optics, and an exemplary finish. 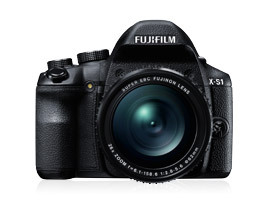 The Fujifilm X-S1 offers a 26x lens that covers an ideal 24-684mm focal range. Its maximum aperture is quite generous for a bridge (f/2.8–5.6) and its optical formula incorporates four aspherical lens elements and two UD glass elements. In the field, photographers will appreciate its manual zoom ring. The Fuji X-S1 differs from all its competitors with its 2/3″ CMOS sensor, slightly larger than the biggest (1/1.7″) sensor for expert compacts (Olympus XZ-1, Panasonic Lumix DMC-LX5, Canon PowerShot S100), and 50% bigger than the usual 1/2.3″ bridge sensors. With a DxOMark Overall score of 49, the Fujifilm X-S1 takes the 140th position in the DxOMark camera sensor score database. The Fujifilm X-S1 gets better results than a lot of ambitious cameras, like the Olympus XZ-1, the Panasonic LX-5, or the Samsung EX-1 — cameras aimed at true photo enthusiasts. The X-S1’s Portrait score (20.4 bits, ranked 139th) lines up with its Overall score. Even though its low-light score of ISO 216 fits right in with its overall score (the X-S1’s rank is 140th for both scores), the X-S1’s relatively poor low-light score should be taken into account by those desiring to take sport action shots and to work in dim light. Yet if you absolutely want to buy a bridge camera, the X-S1 is the best-ranked for low-light score. The Fuji X-S1 sensor operates differently depending on shooting conditions (priority resolution, sensitivity, or dynamic range). This is part of the EXR system that Fujifilm developed (see details here). EXR in other Fuji cameras has been lauded for its efficiency in DR (dynamic range) mode, but we cannot validate its real impact here because EXR mode is not available for manual exposure. Fujifilm FinePix X-S1 vs. Fujifilm FinePix X10: the same sensor? In our tests on the X-S1, we see results that are extremely close to those for the X10. With just one single point between the two DxOMark Scores, the difference is insignificant, and the closeness of the scores certainly leads one to believe that the same 2/3″ 12 Mpix CMOS sensor is at the heart of both of these Fuji-X cameras. Fuji has intelligently reused the same sensor in two cameras that are polar opposites to one another: on the one hand, a fairly bulky bridge with a powerful lens; and on the other, a more conventionally ergonomic expert compact endowed with a 4x focal range, bright wide-angle lens with a maximum aperture of f/2.0. But these results are still fairly flattering for the FinePix F600EXR, which acquits itself very well on the DxOMark test bench: it is far from being truly outclassed by the X-S1 despite the differences in sensor size and resolution. Slightly larger, but on the same order as the 1/1.7″ Canon S100 sensor (the benchmark for large-sensor light compacts), the Fujifilm X-S1’s 2/3″ CMOS sensor takes the lead with a low-light sensitivity score that is 1/2EV ahead — a significant difference attributable to its larger sensor surface size. Portrait and Landscape scores are very close. But keep in mind that we are comparing the sensors of two cameras with radically-opposed design philosophies here: on one side, the Canon S100 is a compact APN equipped with a 5x lens (24-120mm); on the other side, we have a much heavier and bulkier bridge camera equipped with an ambitious 26x lens, and with more carefully thought-out ergonomics — less like a compact, but with a user interface similar to another large-sensor expert compact, the Canon G12. However, from a strictly functional point of view, there are no Sony E lenses capable of covering the X-S1’s focal range amplitude (between 24mm and 624mm). As you can see from the comparative test scores, both cameras’ sensor results are not as different as one might expect in terms of dynamic range. The G1 X is ahead of X-S1 in terms of color depth, with a noticeable 1.3-bit advantage to the Canon. There is also an area in which the 2/3″ sensor of the X-S1 cannot compete with the sensor of the Canon G1 X: low-light sensitivity. The Canon G1 X is 2.5EV better under low-light and that will be obvious on the high ISO images of both cameras. Low-light performance is clearly the main asset of Canon’s premium compact camera. The tests show us once again that sensor surface size remains the preponderant criterion for determining camera image quality, and the comparison between the Sony Nex-5n’s APS-C sensor and the Fujifilm X-S1’s 2/3″ sensor refocuses the debate: Zoom amplitude or sensor size — take your pick. If this holds true, the arrival of this 26x X-S1 bridge sticks a knife into the stereotype by using a larger sensor than is customary for bridge cameras. Fuji can be proud of a performance on par with the best expert compacts such as, for example, the Canon Powershot S100.